We are thrilled to partner with Elements of Shanti to bring yoga to our farm! 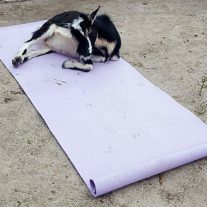 Our new goat yoga is instructed by registered yoga teacher and animal lover Brittany from Elements of Shanti. She will lead the class through a 90-minute light-hearted flowing sequence accessible for all levels. What to Bring: A towel you don’t mind getting a bit dirty, a bottle for water, and wear clothes you can comfortably move in that you don’t mind getting a little dirty. Spaces are limited, so save your spot soon! You can also book a private session of any style for 90 minutes. Flow: Focuses on linking conscious breath with mindful flow through poses. Ashtanga Primary Series: A set practice developed in India by Sri K. Pattabhi Jois is the foundation from which flow yoga is built. Yin: A class designed to stretch the deep connective tissues of the body, the joints, and ligaments. Each pose is held for several minutes and the focus is on allowing the pose to get into the body, not the body to the pose. It is a mellow practice and great for anyone with a rigorous lifestyle. Flow with Meditation: A practice or linking conscious breath with mindful flow through poses closed with inward meditation focusing on relaxing the mind and body. Goat: A playful lighthearted style that brings the joy of goats into your practice. It can be calming, therapeutic, with lots of laughs. Kid Group Yoga, 12 and under = $35 (1 child and 1 parent/guardian). Minimum of 4 for a private group. Send us a message below if book or ask questions! Brittany Holland is a born and raised Tallahassee Florida local. Being homeschooled k-12 she was able to learn abundantly from her family the importance of kindness and sharing with the community. She enjoyed spending time with all the animals of the land, being creative outside and helping her grandfather in the beautiful gardens he had sown. A part of her creative studies was taught by her grandmother guiding her interest in painting and always encouraging her to use the gift of imagination. She also enjoyed music and dance, that still are a part of her today. Her interest in yoga stemmed from her love of gymnastics. Little did she know what big an impact yoga would be, other than a filler for her passion for the acrobatic sport. After suffering from chronic anxiety and panic attracts for many years, the practice of yoga started to help sooth the pain. After years of practicing the healing art of yoga, it dawned upon her that she wished to share her enjoyment and the blessings the practice has to offer. She enrolled in teacher training with Many Rivers Yoga and soon graduated with a 200/hr teacher training in multiple styles and is a registered yoga teacher with Yoga Alliance. She has a passion for all life and tries to do her best to help protect the earth. Her wish is to be an inspiration for people to search for that which helps them heal and enjoy the beauty all around them. While she carries much respect and appreciation for modern day medicine, she is a believer that we have natural gifts all around us that can assist in certain case. She frequently uses natural remedies including essential oils to tend to minor ailments and replace common products around the house. A few of her other passions in life are flow and circus arts and thoroughly enjoys fire preforming as an eater and dancer. While she is a lover of all animals, her favorite are her two darling Pitbull Terriers Fingers, and Selah, and her feisty cat Fiona. She believes that no matter your age, health, flexibility, gender, language, and skin tone are there is a yoga practice out there that could be beneficial to you and that you are capable.